On Saturday, Jan. 27, NASA’s Parker Solar Probe began space environment testing, starting with the air being pumped out of the 40-foot-tall thermal vacuum chamber at NASA’s Goddard Space Flight Center in Greenbelt, Maryland where the spacecraft is currently housed. The chamber – officially called the Space Environment Simulator – creates a nearly identical replication of the conditions the spacecraft will face during its mission to the Sun. After the air was slowly removed from the chamber over the course of five hours, cooling tubes behind the chamber walls were chilled to -320 degrees Fahrenheit (-196 Celsius). Engineers will cycle the chamber’s temperatures from hot to cold to ensure Parker Solar Probe will be prepared for operations around the Sun. During this cycling, the spacecraft’s systems will undergo testing that mimics critical events that occur during its planned seven-year mission in space. The tests are designed to make sure all the systems and components of Parker Solar Probe are operating as designed. This space environment testing will continue for about seven weeks. Parker Solar Probe will emerge from the vacuum chamber in mid-March for final tests before setting off for Florida, where it will launch from NASA’s Kennedy Space Center on July 31, 2018. NASA's Parker Solar Probe Deputy Lead Mechanical Engineer Felipe Ruiz and Lead Thermal Engineer Jack Ercol - both from Johns Hopkins Applied Physics Lab - take us through the process of preparing the spacecraft for space environment testing. 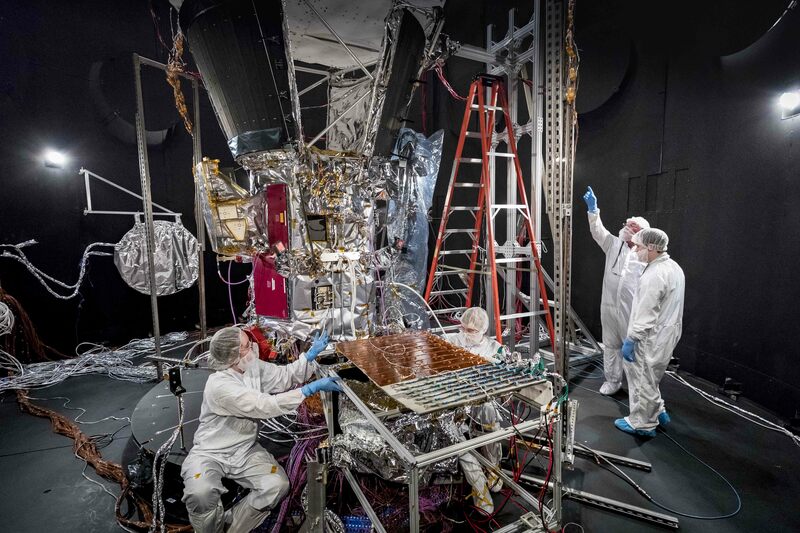 Members of the Parker Solar Probe team prepare the spacecraft for space environment testing in the thermal vacuum chamber at NASA’s Goddard Space Flight Center. The thermal vacuum chamber duplicates the airless environment of space and simulates the cold and hot temperature cycles the spacecraft will endure during its seven-year exploration of the Sun. 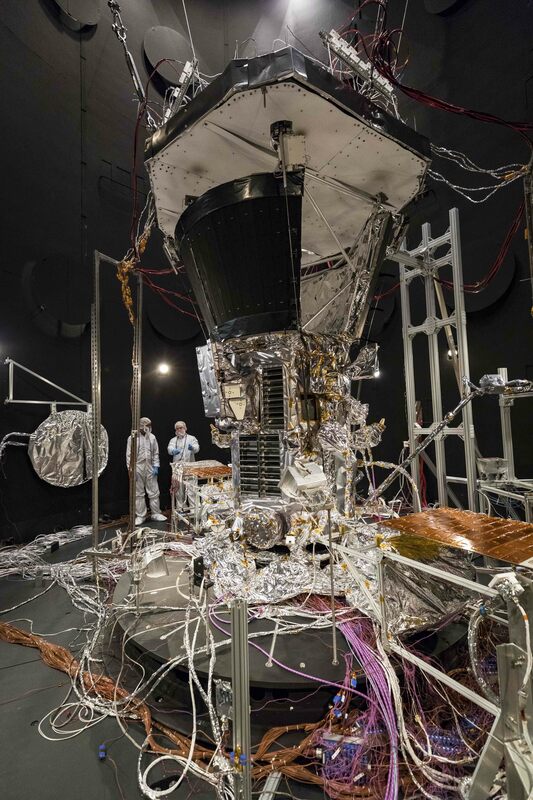 To prepare NASA’s Parker Solar Probe for space environment testing, the team must make hundreds of connections to allow the engineers and technicians to monitor the safety and performance of the spacecraft’s systems. Four hundred thermocouples mounted on the spacecraft let the team track the health of the probe as it undergoes temperature cycling in the thermal vacuum chamber at NASA’s Goddard Space Flight Center. 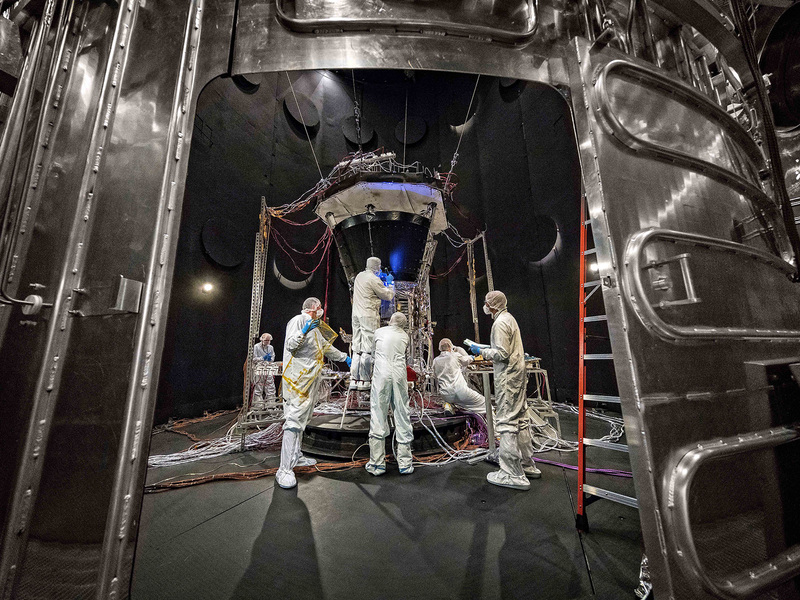 Parker Solar Probe team members from the Johns Hopkins Applied Physics Laboratory work to attach testing and monitoring equipment and sensors to the spacecraft inside the thermal vacuum chamber at NASA’s Goddard Space Flight Center. Space environment testing duplicates the airless environment of space and simulates the cold and hot temperature cycles the spacecraft will endure during its seven-year exploration of the Sun. 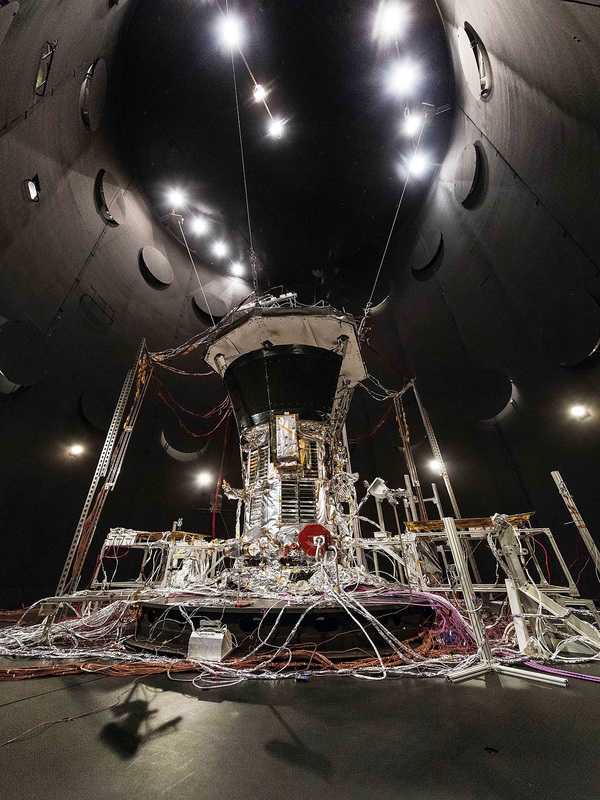 NASA’s Parker Solar Probe sits inside the thermal vacuum chamber at NASA’s Goddard Space Flight Center. On Jan. 27, the spacecraft began space environment testing inside the chamber, which simulates the hot and cold airless environments that the mission will experience during its mission to the Sun. 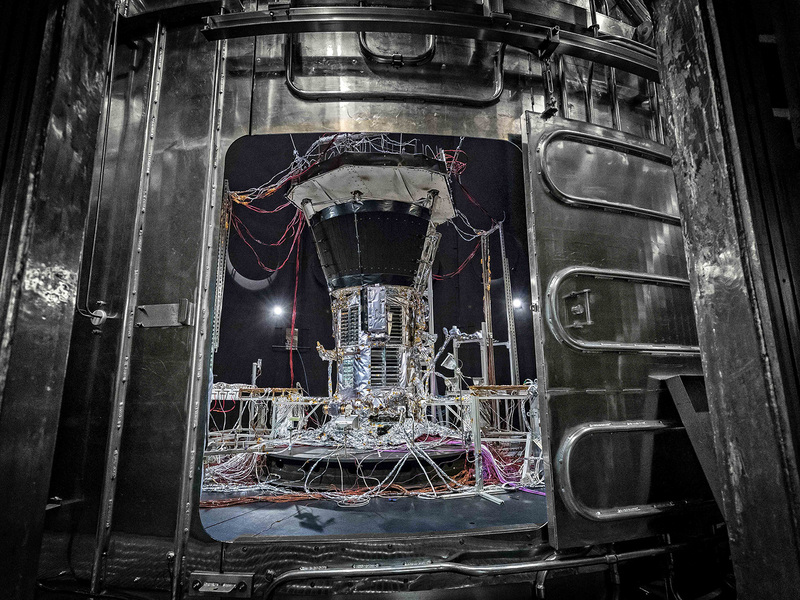 NASA’s Parker Solar Probe, shown inside the thermal vacuum chamber at NASA’s Goddard Space Flight Center just before the main hatch is closed to begin space environment testing. The thermal vacuum chamber duplicates the airless environment of space and simulates the cold and hot temperature cycles the spacecraft will endure during its seven-year exploration of the Sun.